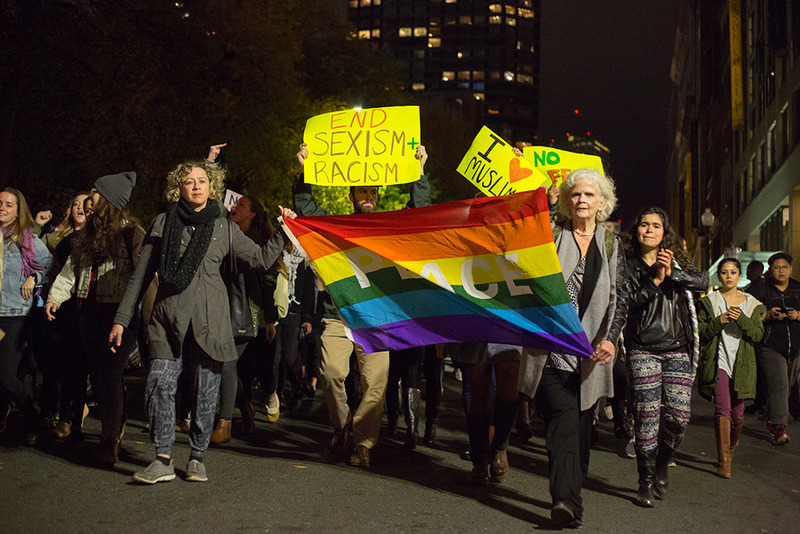 Emerson students joined the thousands who marched through downtown Boston on Wednesday night to express their dissatisfaction with this week’s election results—namely, the election of Donald Trump as president. A speaker for Boston Socialist Alternative said 6,000 protesters met at the Parkman Bandstand in the Boston Common around 7 p.m. and listened to multiple speakers before heading through the Common toward Beacon Street. The event’s Facebook page corroborated the size of the congregation. The crowd walked the perimeter of the Common and down Boylston Street about half a mile to Copley Square. Protesters proceeded down Clarendon Street to Newbury Street, eventually crossing the Public Garden to return to the Common bandstand. This was the third protest held in downtown Boston on Wednesday. The first was a student anti-Trump rally held at 12 p.m. in the Common, and the second an anti-Dakota Access Pipeline protest held in downtown crossing according to Patch.com. Emerson students present for the march expressed a mixture of frustration, anger, and disappointment regarding the election’s outcome. Westling also said she understood the animosity being directed at Trump voters. “It’s hard not to respond with anger when half the country tells you you don’t deserve the same rights as everyone else,” she said. Other students expressed a belief that anger at Trump’s supporters would only do further damage to the country.